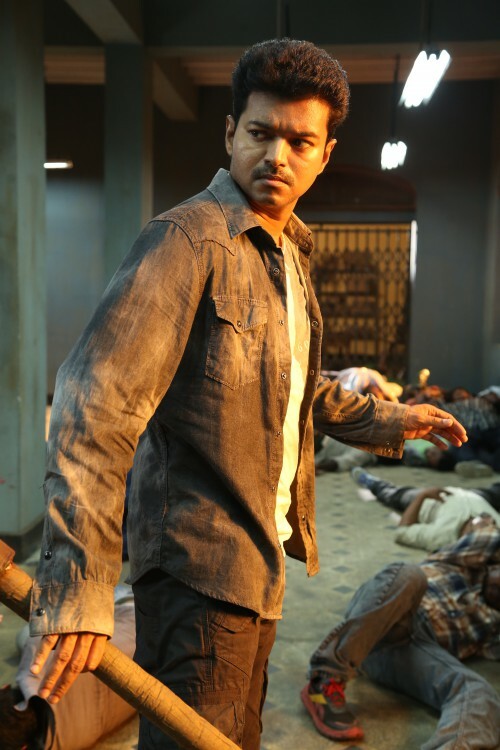 AR Murugadoss and Vijay last got together for the excellent action adventure Thuppakki, but although Kaththi has a good storyline and Vijay is at his best, it doesn’t quite manage to re-create the same magic. 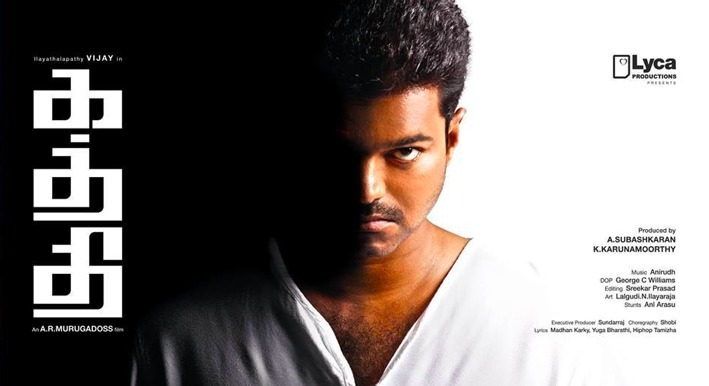 This time Vijay appears in a double role that allows him to explore a more restrained character as well as his more usual action hero, and he manages both with aplomb. However the film suffers from variable pacing and odd song placement, while the inclusion of a poorly developed romance adds to the general unevenness. Still, double the amount of Vijay, the absolutely brilliant older men who make up the support cast and the inclusion of some of the best conceived fight sequences I’ve seen so far this year all ensure Kaththi is definitely well worth a look. 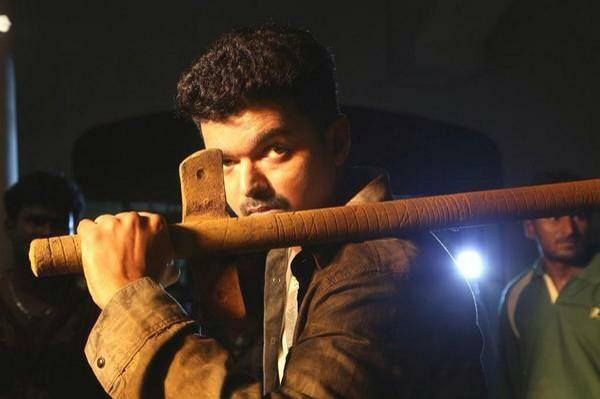 Vijay plays Kathiresan, a thief on the run after engineering a clever escape from jail. 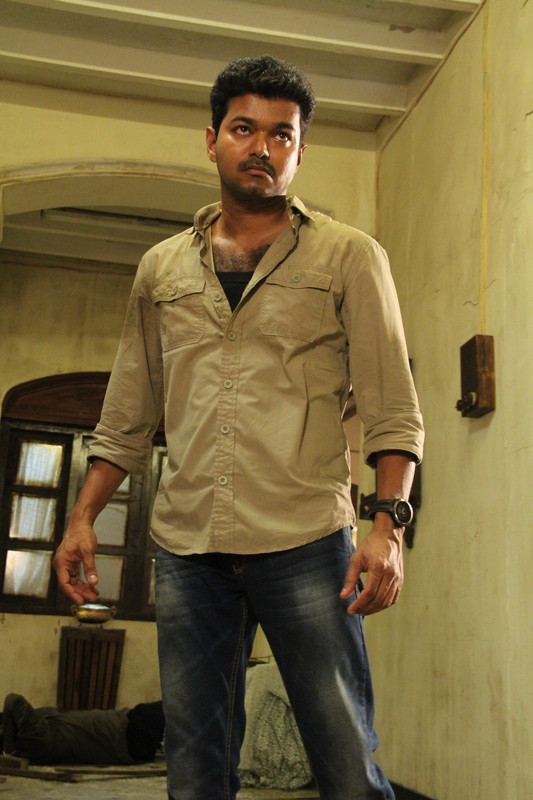 Kathiresan’s path crosses that of his lookalike Jeevanandham (also Vijay) when an attempt is made on Jeevanandham’s life. Jeevanandham is an activist, fighting against a multinational company for the water rights of his small drought-stricken village, although his fight is one being waged through the courts rather than anything more physical. Despite being forced off the road and shot several times, amazingly Jeevanandham survives, and Kathiresan makes the most of their identical appearances by switching identities with his unconscious double. This ensures Jeevanandham is sent back to jail, while Kathiresan is free to make good his escape before the authorities find out the truth. You’d have thought that perhaps changing identities with a man who obviously had problems of his own might have been a bit risky, but Kathiresan doesn’t seem in the least bit worried as he happily takes on Jeevanandham’s identity. Indeed, it doesn’t take long before Jeevanandham’s troubles come calling on Kathiresan. 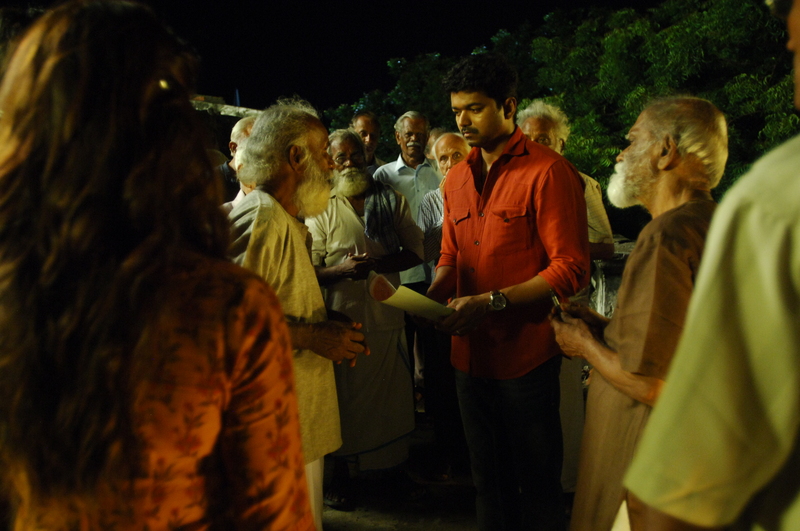 After leaving Jeevanandham in hospital, Kathiresan spends some time as his alter identity and ends up staying at the old people’s home run by Jeevanandham. As a result, he gradually gets drawn into Jeevanandham’s fight against the company trying to force the villagers off their land. Nasty company owner Cedric (Neil Nitin Mukesh) tries a little blackmail, and when that fails to work, resorts to basic intimidation tactics. Of course the thugs are expecting the more passive Jeevanandham rather than escaped convict Kathiresan and his friend Dhanu (Satish), so things don’t work out quite as Cedric plans. In addition to foiling the attempts on his life, Kathiresan and Dhanu concoct various schemes to help the villagers win the pending court case, or at least bring their plight to the attention of the media. It’s not all fighting and mayhem and there are some clever plans and ideas that make Kathiresan a more three dimensional and interesting character. Of course when it is fighting and mayhem Vijay is in his element and the inventively staged fight sequences work well to keep things moving along. There are some very clever ideas and just the right amount of comedy here, and it’s frustrating that less attention to detail has been given to other important aspects of the film. Part of the problem I have with the film is with the character of Cedric and his multinational company. Cedric is very one-dimensional and his company is painted as unethical and completely evil without any redeeming features or basic humanity. While that is perhaps plausible twenty odd years ago or so, I cannot see such a company surviving long without coming up against an activist group somewhere – this is supposed to be a multinational company after all. There is the same old-fashioned and redundant feel to Cedric (I kept thinking of old black and white silent movies with men in long black cloaks twirling their moustaches and laughing while tying hapless women to train tracks – he’s that kind of villain) and this only serves to make his threats appear cartoonish and completely unrealistic. Neil Nitin Mukesh doesn’t get the chance to do anything other than sneer and attempt to look menacing which doesn’t really convince with his floppy hair and oversized sunglasses, so he’s relatively ineffectual as a villain. Also on the minus side is the really quite pointless romance between Kathiresan and Ankitha (Samantha) which never really gets going although the couple initially do look good together. Samantha appears to be added in to the cast solely as a ‘reason’ for the songs, but even there she is relegated to wandering around and posing, while Vijay dances up a storm in the background. It’s such a waste of a good actress, and frustrating since the romance just makes a long film longer without actually adding anything worthwhile to the story. At least the songs from Anirudh Ravichander are enjoyable and the choreography suits Vijay’s energy and style even if their placement often feels random. One other issue I have with the film is the manner in which A.R. Murugadoss uses the serious social issues of farmer displacement, difficulties with land ownership and water rights and industry encroachment on farming areas for the purpose of light-hearted entertainment. It’s hard to define exactly why this made me uneasy but it’s the main reason why I didn’t enjoy this film quite as much as expected. I am sure that A.R. Murugadoss had the best motives in wanting to shine a light on the problems faced by farmers in India, but the treatment of their plight here is rather too heavy handed to be entirely comfortable. The farmers’ problems are somewhat overshadowed by the exploits of the hero as he deals with the corporate villain in typical masala style, which seems to reduce the real life day to day difficulties of surviving drought, debt and corrupt officials down to a well-choreographed fight scene and some snazzy special effects. It could be argued that anything that raises awareness of the problem is beneficial, but I feel that the treatment of their plight here is rather too simplistic. These are heavy and very real issues and I doubt that such an easy and fast resolution is possible in the real world. However, there is a good rousing speech by Kathiresan which highlights the social injustices faced by the farming community – not just in India but the world over – and perhaps that is enough of a start in the right direction. Despite the issues I have with the film, it’s still an entertaining watch. The story is well thought out and I like that Kathiresan has to use his brains and not just hammer his fists through any opposition. It’s clever and there is some good comedy incorporated into the story with nary a comedy uncle in sight. The support cast of old men who make up the displaced villagers are uniformly excellent and Satish is good as Vijay’s side-kick. Vijay is of course the main reason to watch the film and his milder but still passionate performance as Jeevanandham highlights just how good an actor he is when given the opportunity. Perhaps Kaththi doesn’t quite hit the highs of Thuppakki but it’s almost there and hopefully means we will see another A.R. 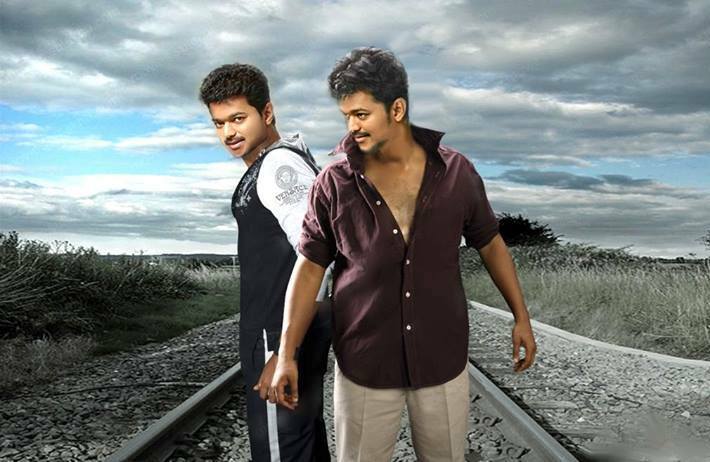 Murugadoss and Vijay collaboration soon. This entry was posted in Kollywood and tagged A.R. Murugadoss, Anirudh Ravichander, Kaththi, Neil Nitin Mukesh, Satish, Tamil, Vijay. Bookmark the permalink.